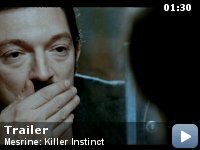 Mesrine: Killer Instinct -- the first of two parts -- charts the outlaw odyssey of Jacques Mesrine (Vincent Cassel), the legendary French gangster of the 1960s and 1970s who came to be known as French Public Enemy No. 1 and The Man of a Thousand Faces. Infamous for his bravado and outrageously daring prison escapes, Mesrine carried out numerous robberies, kidnappings and murders in a criminal career that spanned continents until he was shot dead in 1979 by France's notorious anti-gang unit. Thirty years after his death, his infamy lives on. Mesrine was helped along the way by beautiful and equally reckless Jeanne Schneider (CÃ©cile de France), a Bonnie to match his Clyde. Mesrine made up his own epic, between romanticism and cruelty, flamboyance and tragedy. Anachronisms: As Jean-Paul waits on the platform of the Montreal metro, a "Stand clear of the doors" sticker can clearly be seen. These were only introduced in 2001. The first part of a two part true story French gangster flick about a gangster I had never heard of. What is it with gangsters? I like watching gangster films and I don't care what sort of gangsters they are. Something about the bravado and living the high life seems to appeal and there is always an element of charisma about them. That's not to say I wish to be a gangster or to break the law, but the self confidence and the refusal to take sh** from anyone attitude is attractive. But, were I to be placed in a room with a genuine gangster, I'm certain I would be terrified and would want to get out of there ASAP. 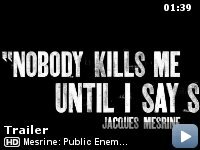 The film opens with Mesrine making a decision whilst in the French army and in Algiers whether to follow his superior's orders to shoot the wife of a terrorist suspect or to shoot the suspect. 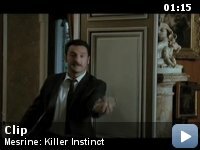 This moment, as well as establishing that Mesrine has the killer instinct of the title, shows us that he is not one for conforming to authority, as he ignores his superior and takes the shot. From that point, the film is episodic as it follows Mesrine from petty crime to audacious criminal exploits. Each episode showcases another aspect to Mesrine's multi-layered character. Yet, because they are episodic, some of Mesrine's character fails to carry over from one to the next. This presents a fairly schizophrenic view of him which could well be in keeping with his real-life persona. However, many of the episodes do provide insights into why this particular person's journey took this particular route. 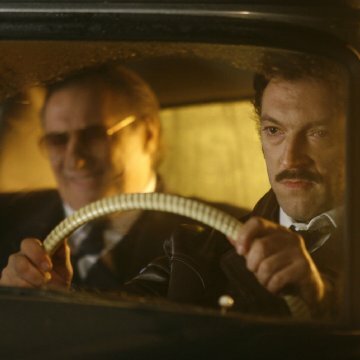 Having left the army, Mesrine turns to petty crime with his friend. This leads him to more serious crime, working for a Parisian crime lord, brilliantly underplayed by Gerard Depardieu. His personal life also keeps pace with his professional ascension. He has an ill-fated romance with a prostitute and a holiday romance that becomes a marriage following a sojourn to Spain. 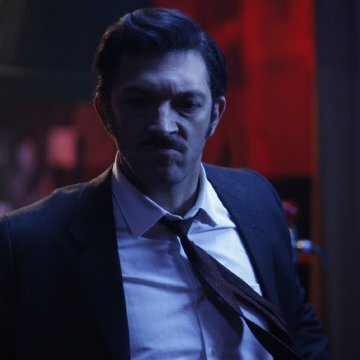 The film also takes the time to illustrate the strained relationship Mesrine had with his parents, in particular his father. Far from coming from a broken home, Mesrine is clearly from a loving, if conservative, family. Only Mesrine's own inner rage, reminiscent of James Dean in Rebel Without a Cause, at his father's seeming lack of courage rocks that world. It is easy to see how Mesrine captured the imaginations of so many. His charisma, very ably aided by Vincent Cassel's own screen presence, shines from the screen whether talking his way out of house or defiantly standing up to his brutal treatment when he is finally caught and incarcerated. He was imprisoned and brutally treated, following a one man / one woman crime wave across the world and, as part of his escape plan he assured those helping him that he would return to break them out. It is testament to his stature that they believed him and it is testament to his word that that is exactly what he attempted. Throughout his return to facilitate the breakout, the film enters the realms of an action movie. The exploits of Mesrine left me wondering just how much the makers had embellished, or Mesrine has embellished for that matter  the film is based on his memoir, or did this guy really do these things? 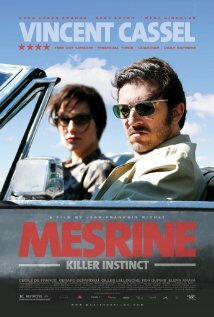 There is one thing that I do know about Mesrine: I can't wait to see part two!